To celebrate our trip, I bring to you a little musical taste of South Africa. We already brought you the modern rhythms of Goldfish, but now we bring you something with a little more African flavor. 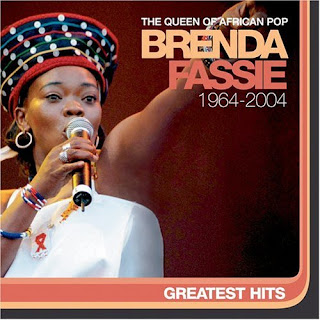 Brenda Fassie, until her untimely death in 2004, was the face of South African music. And like South Africa itself, she lived a turbulent life. Perhaps most famous for her song "Black President" about Mandela, Brenda was accused of losing her roots for a while, preferring a jet setting lifestyle fueled by drug use and singing mainly in English. Late in her too-short career, she returned to her native tongue, and returned to making hits, including these two. Vul’indlela and Nomakanjani are my personal favorites, and every time I listen to them, I can’t help but get insanely pumped for the Cup. So get up, get your African boogie on, and get ready. 2010’s going to be a great year.